In a city that has always looked ahead relentlessly, there's not a lot of time devoted to reflection. Even while pausing to remember the victims on the anniversary of the shooting, Las Vegas moves forward. LAS VEGAS (AP) — A small bouquet of dried flowers was wedged inside the padlock on Gate 5 of the killing ground that was the Route 91 Harvest Festival one recent day, the only visible reminder that it was the site of the worst mass shooting in modern American history. A peek inside the chain-link fence, covered in green sheeting to keep out prying eyes, revealed a sprawling patch of asphalt and little else. Towering above were the gold windows of the Mandalay Bay, where a gambler spent the last minutes of his life in room 32-135 taking the lives of 58 others in a meticulously planned slaughter. Around Las Vegas, there are scattered remembrances of the horrors of that night a year ago. Almost every week, there’s another court-ordered release of police body-camera videos that provide flashbacks to the night the gunman turned the fun of the glittering Las Vegas Strip into a nightmare of death and despair. And lawsuits by MGM Resorts International to force survivors to give up their right to sue the casino company that owns Mandalay Bay opened fresh wounds over the summer. But the “Vegas Strong” T-shirts and car stickers have largely been put away. The original handmade white crosses for each victim have long since been taken away from the “Welcome to Fabulous Las Vegas” sign to eventually reside in a museum in neighboring Henderson, though some new ones were brought in for the anniversary. There has been no closure, at least officially. Authorities say they will likely never be able to determine what it was that turned a high-limit video poker player into a mass murderer. But in a city that has always looked ahead relentlessly, there’s not a lot of time devoted to reflection. Even while pausing to remember the victims on the anniversary of the shooting, Las Vegas moves forward. Indeed, a look out one side of the high windows of the Mandalay Bay shows the normal sight of dozens of tourists lined up to have their pictures taken in front of the Welcome to Las Vegas sign. A glance to the left draws the eye to the vacated and somber site of the shooting on 15 acres of valuable Las Vegas Strip land that for the foreseeable future simply cannot be used for anything. Owner MGM Resorts International has no plans for the venue and no timeline for making any decisions. Meanwhile, on the other side of the hotel, work goes on around the clock on a new $1.9 billion stadium that will be the home of the NFL’s Las Vegas Raiders beginning in 2020. It’s a reminder that Las Vegas moves on like it always has, through the good times and the bad. It’s not that the city has forgotten the shooting or the victims. The white crosses adorned with pictures of those killed were moved recently for the anniversary to the rotunda of the Clark County government building, accompanying a heart-wrenching display of paintings of each person. The victims are portrayed as surviving relatives wanted them to be. One young woman is wearing a Philadelphia Eagles jersey; a man is strumming a guitar. There’s a police officer in his uniform, and a man smiling while enjoying a day on the beach. Gathered together for one night to enjoy country music , they are now linked together in eternity. There’s a makeshift memorial garden downtown, just around the corner from an adult bookstore, where painted stones and pictures hung in newly planted trees tell stories of lives lost. “Rest easy with my grammy, Beebra,” read the inscription on one framed picture of a smiling woman and her young children. On a recent day, a few workers were digging a hole for a 3,000-pound (1,360-kilogram) rock with the victims’ initials. A permanent memorial will eventually be located elsewhere — no word from MGM on what will happen to the shooting site itself — but has yet to be planned and is likely years away. Everybody has a story about how a community came together in the wake of the shooting. Strangers loaded victims in the back of their pickup trucks and rushed them to the hospital. Doctors and nurses rushed in to try to save the wounded, and people — including players from the city’s newly minted NHL team — lined up by the hundreds to donate blood. Residents dug deep into their pockets to donate to the victims and their families . It was, former Las Vegas Review-Journal gossip columnist Norm Clarke said, reminiscent of the response to the 1980 MGM Grand fire that killed 85, when there was a community outpouring for those killed. As with the fire, most of the shooting victims were tourists. Only five were from the Las Vegas area. But Las Vegas itself is a city that largely is a collection of immigrants from around the nation and the world, many with no ties to each other before the shooting seemed to bring them together, at least temporarily. Lee, the community activist, remembers neighbors in gated communities who had done little but nod at each other over the years gathering to talk afterward. And a ceremony at the first Golden Knights hockey game a few days later had anyone who watched shedding tears. Soon, though, “Vegas Strong” largely morphed into “Vegas Born” with the hockey team. Its improbable run into the Stanley Cup Final became more of a story than the way the team helped bring a city together to heal. And through it all, the fun never really stopped on the same Strip where the massacre unfolded. 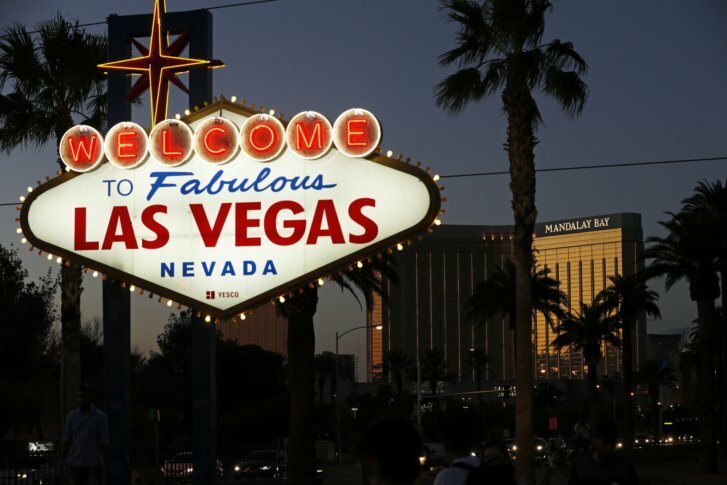 A city that attracts 42 million visitors a year kept the welcome mat out following the shooting as tourists drank, partied and threw the dice inside bustling casinos. It’s taken the Mandalay Bay some time to recover its footing, and tourism numbers are down slightly this year. But Las Vegas’ reinvention continues with the new stadium and the resumption of construction at two big hotel projects. And now, as the popular local Twitter feed Vital Vegas asked: How do you commemorate something you don’t want to think about? The city will mark the anniversary with a string of events in the days surrounding Oct. 1. And at 10:01 p.m. — the time the shooting began — the lights on gleaming marquees will dim along the Strip. It’s not closure, but it is one more tribute in a way only Las Vegas can give. Then, as always, the city that never sleeps will move forward once again. Find complete AP coverage of the Las Vegas mass shooting here: https://apnews.com/tag/LasVegasmassshooting .